THE term " dew-pond " has been applied in the past to certain high-level ponds, the chief characteristic of which is that, as a general rule, they do not fail to give a supply of water when other ponds at lower levels have dried up. The source of the water by which the latter are supplied is apparent. They are fed in general by surface drainage, by brooks and ditches, or by the drainage from a road or high shelving ground around. The sources of supply in these cases are visible, and there is no mystery as to their origin or their replenishment. In the case, on the other hand, of ponds on high ground, where there are no brooks or ditches, and little, if any, drainage, certain of them have been found either never to have run dry within the memory of man, or only very occasionally. It has appeared, therefore, to those who have used such ponds, that there must be some means of replenishment which is not known in the case of ponds at lower levels, and, as there has been no visible source of replenishment at the higher levels which is not present at lower ones, it has been judged that moisture is received at the former in a mysterious invisible manner, and as the high grass ground around such ponds has been observed in the hottest weather to be thickly covered by dew after nightfall, it has been assumed, although not proved, that similarly the ponds received a deposit of dew, and so, with the customary habit of assuming where proof is absent, such ponds, about which the mystery hangs, have come to be termed dew-ponds. All ponds on high ground are not called dew-ponds, but there seems to be no agreement as to what constitutes a dew-pond, even between those who use the term for some ponds whilst denying the title to others. Mr. Slade has endeavoured to show that there is no such thing as a dew-pond, but I think there are reasonable grounds for believing that certain high-level ponds do owe their maintenance to some other source than the rainfall, although the rainfall is a considerable factor in filling all ponds. The point we have to remember is that rain-fed ponds at low levels do run dry, as a rule, more rapidly than those on high ground, and this statement has been attested in the past by very many observers, from Gilbert White onward. If this were not a fact, we may assume that the term " dew-pond " would never have arisen, since, as I hold, it was invented to describe those ponds whose replenishment was a mystery, and for whose filling rainfall alone was seen to be insufficient. We start, then, with the postulate that certain high-level ponds maintain their supply in the driest, hottest weather, long after those in the plains below have more or less completely dried up. It seems to be generally acknowledged by farmers on and near the Sussex downs that the word " dew " must be held to include mist and fog, and the word "mist-pond " is, as a matter of fact, more in constant use in some parts than the word " dew-pond." Any inquiry into the source of the supply must therefore, I think, comprise in its scope the possibility of both dew and fog being deposited on the surface of a pond. One sees occasionally on a damp morning, or sometimes even late in the day, a deposit of water on the walls of a house, inside as well as outside : the walls " sweat," as it is called. There has been no fog, and one cannot call it dew. It is condensation out of the atmosphere, perhaps taking the form it does because of a lack of dust-particles in the atmosphere for the vapour to settle upon. Similarly we must consider the possibility of a condensation of this nature in a pond. Such might happen when a moving mass of heated and saturated air came in contact with a cooler water surface. Again, on many a damp morning, but with no fog, tall trees will be heard dripping their burden of aqueous condensation on to the road or paths beneath. This cannot be termed dew, properly speaking, although frequently referred to as such. So the fall of condensed vapour of this nature from vegetation must come within the scope of an inquiry into the subject of " dew-ponds." * Research Department, April 22, 1909. The "dew," therefore, which goes to fill our dew-ponds must be regarded as including mist or fog and any possible form of condensation out of the atmosphere other than rain. Dew-ponds are always found on high ground. The question arises as to whether the maintenance of their supply is due to this position, or whether there is something in the manner of their construction which encourages an extra amount of precipitation over them. First, as to their position : this is usually the highest ground in the neighbourhood, sometimes at the very summit of the downs, and in Sussex, at any rate, without a single tree near which could in any way influence the deposition of moisture. In Berkshire and Surrey there is frequently a large overhanging tree. Wherever dew-ponds are found, it is a necessity, as most of the evidence goes to show, that they should either be upon chalk, or, if the subsoil is not chalk, a chalk foundation must be laid down. This would seem to show that chalk is a factor in the matter. With the aid of a Royal Society Government grant, I have lately had under my special observation a tract of downland in Sussex, bounded on the north by the escarp­ment of the South downs from the Devil's dyke to Plumpton, and in this area are included some excellent ponds. My headquarters have been one of the disused mills on the Clayton downs, close to whose base is the Ordnance Survey bench-mark of 581 feet. A long spell of dry weather happened while I was there, and, being on the spot from dewy eve till early morn, I was able to make some useful and interesting observations. There are many downland ponds in the area to which I have referred ; but two ponds stand out conspicuously amongst the rest as excellent examples of dew-ponds. The first is one which stands high up above the waterworks in the Waterhall valley, near Patcham, and is about 700 feet above sea-level. When I last visited it, on September 13 of last year, the water-edge had a circumference of 260 feet. Between the edge of the water and the top of the ridge surrounding it, there was a shelving bank, measuring 15 feet across, the ridge itself being 347½ feet round. The centre had a quantity of green growth below the surface on the eastern side, the place of this being taken by potamogeton on the western side ; but in neither case did this approach to within 3 feet of the edge of the pond, nor did it grow above the surface of the water. All around this centre of green was a band of this width of clean white chalky puddle with no dark impurity at all. Around the edge of the water there was, on the northern side, a peculiar little ridge, like cliffs in miniature, marking the boundary of the pond. On the shelving bank thistles and hawkweeds and other plants were growing, and the pond would not appear to have exceeded for a long time its present limits. The pond is but slightly below the summit of the down, and had no drainage except such as it received from the banks. The second dew-pond I specially refer to is near High Park Corner, 700 feet above sea-level, on the road between Ditchling Bostel and Brighton. On August 12 it measured 227k feet around its edge, and between the edge and the top of the ridge there was a gradually shelving bank, 20 feet across. This, of course, gave a considerable collecting-ground, but with this exception there was no drainage whatever. A few yards away a large pit has been excavated to a depth considerably below the level of the water, and if the bottom of the pond were not completely watertight, the water would rapidly drain away. There is but little weed in the pond. The water is clear, and the puddle is a chalky white, hardening completely where exposed to the sun. On August 12, at 1 p.m., the temperature at 1 inch was 72'; but at 12 inches it was 67°, or 5° less. The sun was beating down strongly at the time. I could gain no information as to where any of the ponds about here were made, and therefore no information as to the manner of their formation. There is some clay in large pockets in the chalk near at hand; but, so far as could be seen, no clay had been used. A little distance below the highest ground is another pond, which, 1 was informed, had been repaired about fifty years ago, and the clay bad been carted there for the foundations. Most of the ponds are, in general, clay-puddled, the ponds being more easily rendered waterproof by this means. Scattered along the downs are numerous depressions which appear once to have been ponds, but neglect has caused them to leak and run dry. The life of down-land ponds is so long that they seem almost to be perennial. Hence, when once a pond has been successfully made, and it passes in turn into the hands of successive farmers, records of its making are lost, and, in view of its apparent perennial nature, it comes to be neglected. Then, when finally it ceases to be waterproof, generally by grasses and rushes growing their roots through the puddle, it gradually dries up, and then, the secret of its formation not being remembered, it soon reaches the stage of becoming covered with downland grass, and an empty hollow alone remains. So little is done to most ponds nowadays in the direction of repairs that it is scarcely to be wondered at that so many empty pond sites are seen. As regards those that still hold water, there is little unanimity as to which are and which are not dew-ponds. And when one who has known such ponds all his life is asked why one is called dew-pond and one is not, he can give you no clear answer. We must, therefore, find an answer for ourselves. All ponds receive a quantity of rain; but to be a dew-pond it must by some reason or other attract dew from the atmosphere, deposited either upon its shelving banks or upon the water itself, or it must receive and arrest thick banks of mist, fog, or cloud, and assimilate the moisture. The shelving bank must in any case be a considerable factor in the matter, as I have poured water on the banks of well­puddled ponds and have found that the water had run down to the pond with no apparent percolation into the bank. For dew to be deposited on the surface of water it is generally considered that the temperature of the water must be below dew-point. We can leave aside the question of dew in the winter and spring months. The ponds to be useful must be receiving dew in the hot summer months, when drought may be prevalent, and when ponds on lower grounds are drying up. Ponds exceeding 4 feet in depth are rare, so that we have these ponds in shallow basins of perhaps 30 to 70 feet across, and the broad surface is being heated all day long by the sun. Water takes much longer than the soil or the atmosphere to become heated, but when heated it retains its heat correspondingly longer, and this is the greater the greater the depth of the pond. The accompanying diagram (p. 177) shows how that whereas the temperature on the grass went down from 52° F. * to 30° on the night of September 21, that on the surface of the water in my experimental pond sank merely from 50° to 42°•5. Dew was forming on the grass at 9 p.m., the dew-point for the night being 45°•5, as determined by the wet- and dry-bulb thermometers. Of course it does not follow that when dew-point was reached on the grass the pond•water commenced to receive dew. The deposition of dew would be at first upon the most powerful radiators of heat, and amongst these grass stands high. Water is a very bad radiator, and would be the last to receive dew, if the acquisition of dew on its surface were merely the result of radiation of its own heat and the chilling of the air above it by contact with the cooled water surface. * In each case Fahrenheit scale has been used. will be seen that the water (rain-water received during the few days since the completion of the pond) had already, at 8.30 p.m., reached a comparatively low temperature. This may be attributed to the fact that there were but 3 or 4 inches of water, and to the construction of its bed. It has been stated by Prof. Miall that a dew-pond must not be greater than about 4 feet in depth, this being about the depth which will allow the water to cool as a whole during the course of a summer's night. If it be greater, then evaporation will proceed until about that depth has been reached. If my pond remains sufficiently full in the summer to enable temperatures to be taken at 6 inches and 12 inches, or deeper, then it will be seen whether the pond, as a whole, reaches night after night a temperature which is below the dew-point. The grass around will be the first to receive dew, and the period of dew-deposit will Le much longer there than in such a pond, since even supposing a large pond does, as a whole, actually reach a temperature below the dew-point, this will only take place late at night or in early morning. In the morning, when the sun has risen, the warm air from the down will, I think, not soon interfere with the cold heavy air in the depression of the pond, and so the water will but slowly be warmed. A great deal depends on whether large ponds do actually, as a whole, reach a low temperature at night. If they do, and a fog be drifting in from the sea in the early morning, that portion which drifts into the depression will be further chilled, and may deposit its moisture. On the other hand, mist may merely be deposited in the pond mechanically as it passes over. There was a long fogless period in August and part of September, and this may have accounted for the drying up of the pond called One Tree pond. On July 25 there were but 9 inches of water, although the circumference of the pond was 102 feet. Owing to the shallowness it became rapidly heated each sunny day. The temperatures at 1 inch, 6 inches, and 9 inches were all 71° at 1.30 p.m., that on the bank exposed to a south-west wind being 67°. The pond, as a whole, had become heated to this temperature, and evaporation was proceeding. On July 24, at 8.20 p.m., the temperature at the same three depths was 67°.5, the cooling to this slight extent in the shallow basin having apparently been uniform. The temperature on the bank was at the same time 58"5, this again showing the less rapid cooling of the water than on the dry bank. A shallow pond seems to have no chance whatever in hot, settled weather, since the evaporation of the day would be continued well into the night, and possibly throughout it. On July 28, at 8.30 p.m., the thermometer at 1 inch showed 64°, and at 6 inches 63°•5. These temperatures were soon reversed, and at 9.10 p.m., whereas 1 inch showed 62°, 6 inches showed 63°. Then, at 9.50 p.m., both showed 61°. On each occasion the temperature of the air immediately above the water, as shown on floating cork, the bulb overhanging the water, was less than the 1-inch water temperature. At 8.30 p.m. it was 57"5, and at 9.50 p.m. it was 55°. The dew-point some distance away was 50•8, but the wind was too high for dew-deposition. It will thus be observed that the atmosphere was on each occasion colder than the water, and hence there would be no possibility of the water chilling the air sufficient to compel the latter to disgorge its aqueous vapour. If vapour were actually given up by the air there must have been some other cause for it. The rain came on at 10 p.m. Had it proved a clear, starry night the atmosphere over the pond might have become still further reduced, but the pond would have lost its heat still more slowly, and the difference between the two would have become accentuated. The effect of radiation of heat from a pond upon the air above it must be regarded, I think, in a different light to the effects of radiation of heat from the earth's surface, e.g. the down-land. In the latter case, the heat rises with vapour out of the interstices of the soil, and is dissipated into space. The soil being cooled, brings about the cooling of the stratum of air in contact with it. When the cooling reaches the dew-point, the best radiators receive a deposit of dew. But as regards radiation from the surface of the pond, we have seen that the surface temperature is such that it can seldom have effect in cooling the air above it, since the air is already at a lower temperature. The cooling of the air must have been due to other causes, and I doubt if equilibrium between the two is ever obtained. Take one of the cases men­tioned. At 9.50 p.m. the water was, everywhere in the pond, at 61°. The air immediately above it was 56°. The water was no doubt losing heat, but the air was losing it more rapidly, and the temperature of the air would easily fall below dew-point some hours before that of the water did the same. In that case, the point of saturation being reached, the stratum of air must give out some of its moisture, and this would be rapidly assimilated into the pond. If evaporation of the pond were proceeding at the same time, this would tend to cause the point of saturation of the air to be reached the earlier. So I am inclined to think that dew may be received by a pond on its surface even while the pond-water itself has not yet fallen to dew-point. On the other hand, if it can only receive dew by chilling, as it is often said to do, the air above it, I cannot see how pond-water can ever reach a temperature at night-time lower than in the air above it, which would be necessary, if there is anything in this alleged chilling, so long as there is no change in the weather. It could only happen after some hours of freest radiation, and by this time probably the early sun will have begun to warm the air, the effect of this being to increase the amount of vapour which the atmosphere could hold without being saturated, and hence removing all possibility of precipitation. Even at 8 a.m. on August 9 the air at the surface of the water was but 58°, whilst 1 inch under the surface it was 60°. This was in light fog blowing from south. It is not, perhaps, very important as to whether the dew "falls," as Dr. Wells demonstrated in 1814, or whether it rises, as has since been shown by Edward Blythe, and later by Dr. Aitken. Both theories have been maintained in turn by various meteorologists. It is, however, very easily demonstrated that both are correct. Two illustrations will suffice. On the night of August 13, two opaline saucers were placed on the grass. On one was placed a portion of cotton-wool. The other saucer was inverted, and a portion of cotton-wool placed beneath it. 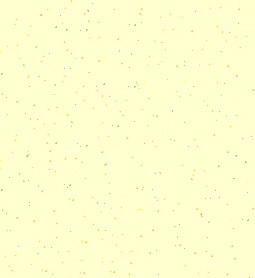 The former portion was covered when examined thc following morning with medium-sized beads of dew, the latter was dry. The dew, therefore, fell in this case. Again, a thermometer with a broad opal scale was supported between two double earthenware pans. But on October 30, 1907, 1 placed two square polished tins to catch and con­dense the vapour radiated from the earth. One was inverted. In both cases no dew was found on the uppermost sides of the tins in the morning, whilst in both cases the undersides were well covered with dew. Here, therefore, the dew rose from the earth after nightfall. Thus, on different nights it is not difficult to prove that both theories may be correct. It must be confessed, however, that out of the numerous occasions on which I placed articles out at night to detect the dew, by far the majority received dew on the uppermost side, and so the older-fashioned theory of the two was well sustained. And it is well for dew-ponds that it was so. If the ponds were recruited from dew only which rose as vapour from itself, it would gain nothing, whereas it would lose by evaporation which proceeded in the day-time, and the balance would be on the wrong side. To sum up so far, the pond must not be too shallow, or it will become heated as a whole during a summer's day, and evaporation will proceed both day and night. It must be recruited principally by "falling" dew, but the temperature of the water need not, it would seem, be below the dew-point to receive it. In addition it may be stated that a gentle movement of the air over a pond would be beneficial, to waft away that portion which had given out its dew, and which consequently would have become warmed in the giving out of latent heat by the vapour contained in it. As regards the construction of a dew-pond, the theory has been advanced that straw is placed in some part of the foundations with the direct object of cutting off the upward rise of heat from the earth, and so allowing the water to become more rapidly cooled. This, of course, assumes that it is necessary for water to cool below dew-point before it can receive any accession. There is no doubt that straw frequently does enter into the formation of a pond's foundations, and probably a low temperature in the water is a desirable object to aim at. This being so, it seems reasonable to imitate the process by which ice is obtained in India at night-time, while the temperature of the air above it may be a good deal above 32°. Shallow earthenware pans, with water contained in them, are placed over about a foot of straw, and the straw prevents, by reason' of its non-conductivity, the earth's heat from rising and warming the water, whilst the heat of the water is lost by radiation. Thus, although the temperature is above 32°, films of ice appear in the pans. Dr. Wells repeated these experiments, and added another, for in one of the pans which he left empty at nightfall, he found moisture had been attracted, and this had been converted into a film of ice. Although I have found that straw is used in various places in the foundations of dew-ponds; not one of the builders of such ponds seems to hold that the straw has anything whatever to do with the filling of the ponds. The opposite diagrams will show the foundations as laid according to various authorities. It will thus be seen that, in a majority of the cases quoted, straw is used in one position or another, whilst its utility as a dew-producer is, as a rule, denied. It seems to me as possible that the memory of the reason why straw is used has been lost in the course of generations, owing to the serviceable age of such ponds, but that the practice has continued in spite of this lack of " folk-memory." In the majority of instances shown, chalk rubble is used as the topmost layer, to -prevent the perforation of the puddled clay by the hoofs of animals. In Sussex I have examined a number of downland ponds, and do not find this to have been the case. It is true that small chalk is now strewn over the bottom of a pond when repairs are undertaken, but this is only preliminary to the grinding of it to powder and to the puddling which follows, by driving a team of oxen or horses harnessed to a broad-wheeled waggon, repeatedly round and round, and through the pond, for at least a whole day. This process grinds the chalk to a powder, and lays it down as a waterproof puddle, and when there is no clay near at hand it is, of course, far more economical than carting clay to the site. When there is clay at hand, clay undoubtedly is used, as being more reliable as an impervious bottom. Mr. Wooller, of Clayton, who went to live at the top of Clayton Downs in 1875, informed me that when a boy, he knew a pond which sometimes held a little water in it. When it had some water he obtained permission to drive his horses into it to clean their hoofs on his way home. After having done this repeatedly the pond began to hold more water. In fact, he had involuntarily puddled it, and the pond ceased to leak. In these cases there was, at any rate, no fear that the cattle would perforate the bottom. He also says that when a pond on Dale Hill was getting low his master used to set him to drive the oxen round and round the pond. He got very tired of his job, not seeing any reason for it, but it was no doubt with the object of well puddling the bottom, and so making it waterproof. When this process has been completed, and the cattle or the broad-wheeled cart have done their work, men would take broad spades and flatten down the surface or smooth out the puddle until it was smooth as glass, but the centre was not generally touched, and if there were weeds and grasses growing there these were left, unless it was thought that their roots had gone too far down. The puddle on the banks of the pond, which increased in area as the water diminished in area during drought, set as hard as cement. The absence, then, of rubble, and the use of oxen, etc., for puddling, make me doubt whether the Southdown ponds have straw, at any rate immediately under the puddle. I am referring, of course, to those ponds in which one can see that chalk puddle and not clay puddle has been used. Mr. Turner, of Ditchling, who is familiar with the ponds on the hills of his neighbourhood, has never heard of straw having been used in any of them. On the other hand, no one hereabouts seems to know of any ponds having actually been made within recent years. There seems to be a general agreement that lime should be mixed with clay-puddle to prevent the working of worms. It is a question whether earth-worms could be a danger under a pond, but there is the little red-worm, which must be guarded against. I am not familiar with many clay-puddled ponds, but there are two over Pyecombe, which I have examined, in which not a vestige of chalk or white puddle can be seen. One is excavated on a steep slope, so that one bank is very much higher than the other. On the side nearest the lower bank I was struck, on approaching it, by the red colour of the ooze where it was just covered by the water. Immediately I touched it, in order to take up a handful of the muck, the colour suddenly disappeared, only to reappear in a few seconds. On repeating it, I saw that the colour was caused by thousands of little red worms, and these, on the slightest movement reaching them, disappeared as if by magic. I think that the working of these red-worms would be a thing to guard against, in the case of ponds bottomed with clay puddle. I have kept some of these worms in captivity, so to speak, and find that, when the mud is sufficiently tenacious, they not only honeycomb it with their borings, but form tubes of mud, which may project as much as a quarter of an inch from its surface. When in the water, they travel far and wide by rapidly-made twists and jerks, looping themselves like the letter S, until they find a suitable lodgment. The pond I refer to received very much drainage, and could not be regarded as a dew-pond. The second clay-puddle pond was about a mile further north, and contained clearer water, although it was also on the slope of the hill, but there was a gorse bush growing down to the water's edge, whilst on the opposite side there was, close to it, the hedge which formed the boundary of the field, with a few fair-sized trees in it, and these, no doubt, gave a good deal of water to the pond by means of high-formed dew and the moisture from the mists. There was also a considerable quantity of drainage from one side of the pond. These two ponds, although not dew-ponds, bear upon the subject, and may thus serve to throw light upon their replenishment. It has been estimated that the average annual dew-fall does not exceed 1.5 inch. This, of course, is founded on the amount of dew which is deposited upon surfaces other than water. If dew is deposited on water in the manner which I have suggested, this estimate may there be exceeded. A heavy deposit occurred on the night of September 15. The night was clear, and the moon was bright. I had excavated a trough about 4 feet deep, and had placed a quantity of wood-wool over an area 6 feet square at the bottom, and this was covered by planks of wood. In order to keep it dry, and anticipating a dewy night, I spread over the whole a piece of waterproof sheeting 6 feet square. In the morning I poured the dew from it into the rain-measure, and found that it showed 1.31 inch. Spread over the whole area of 36 square feet, this would be a deposit of about inch (0.00496 inch). If this amount of dew fell each night throughout the year, we should have a total annual dewfall of 1.8104 inch ; but I do not think it would be right to regard this one night's dew as a fair average. Probably not more than three times the amount would be deposited in any one week, and, estimated on these lines, the annual dew-fall would be 0'77376 inch, or somewhat over three-quarters of an inch. I have elsewhere made the suggestion that if we seek a non-conducting material for the bottom of the pond, which shall at the same time be comparatively inexpen­sive, we shall find it in logs or planks of wood. Vegetation of all kinds is, of course, an excellent radiator and non-conductor, and when we see the bushes and grass covered with a deposit of hoar-frost, we can also notice how thickly the frost stands upon the wood of a fence. Evidence of its non-conducting property is also seen, as Mr. Hubbard has suggested, in the appearance presented by the ballast over the sleepers of a railway line, where frost will remain after it has disappeared from the material which is not underlain by wooden sleepers. Gilbert White mentions the fact that on a winter's morning trees have been discovered in the bogs, since the hoar-frost has lain longer over the space where they are concealed than in the surrounding morass. He suggests that old obliterated drains might by this means be discovered, as well as relics of Roman stations and camps. In order to test the extent to which the temperature was affected above and below wood resting on the downland, I placed two thermometers on a plank which rested on the grass of the downland, and one underneath the plank (August 16). Next morning the one beneath showed that a minimum of 51° had been reached. One that was placed completely over the wood went down to 48°•5. The third was placed so that the bulb and half of the tube was resting over the grass. This went down to 42°.5. Thus, although the temperature over the plank was higher than over grass, it was yet 2½° below the temperature beneath the board. The night was a clear one. On the same night the minimum temperature of 48°•5 was reached also in the following instances : in an opaline saucer, lying over a small red earthenware pan, and in a similar saucer over a tray containing chalk puddle. showed a minimum of 510; another resting completely on the wood, which showed 550; a third resting with its bulb and a portion of the tube over the grass, with the remaining portion on the wood. 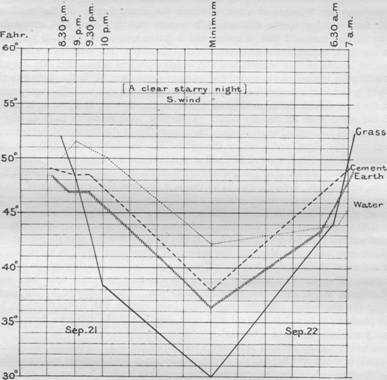 In the morning the latter two showed a temperature of 55°, a higher temperature than the first mentioned; thus the relative temperatures were reversed when compared with the results of the night of August 16. The night was, however, a very cloudy night, and the deposition of dew at all was somewhat remarkable. There was no dew on the opal scale of the thermometer beneath the wood, but there were large beads on that portion which projected. The second thermometer was covered with large beads. The third had no dew at all where it overhung the grass, but where it rested on wood there were large beads in the morning. Thus, though it was a night when but little dew, if any, might be expected, yet the wood had so lowered the temperature of the air above it, by cutting off the earth's heat, that dew was deposited. In regard to the question as to how far fog or mist goes towards replenishing ponds, it is well to bear in mind that the term " mist-pond " has been found in use in the neighbourhood of Worms Heath, in Surrey, in Kent, and in Wiltshire, ' as recorded by Messrs. Johnson and Wright. Mr. Johnson also records, in his `Folk-Memory,' on Mr. T. W. Shore's authority, that the term " cloud-ponds " is used in some parts of Hampshire. I am also informed that some of the older inhabitants of Hampstead knew certain ponds on the heath by the name of " fog-ponds." If we give credence to the belief that dew is deposited in ponds, because people have come to call certain ponds by the name of "dew-ponds," then, it would appear, we have just as good evidence, if such it can he called, that certain ponds ate recruited from fog, mist, and cloud ; perhaps, indeed, better evidence. Every one acquainted with the Sussex downs must be familiar with the sea-fogs, which sweep inland from the south. One's clothing quickly becomes covered with a deposit of dew-like beads, and it seems to me that the warmth of pond-water will in no way act against the deposition of mist. The clump of trees surmounting Chanctonbury Ring is frequently completely hidden by its mist-cap. Sometimes, long after the mist has disappeared, not only in the weald below, but from the downs in the immediate vicinity, the whole area reeks with moisture. It is noteworthy that the mists are generally on the move, although I have not yet seen them being driven northward of the downs in the shape of clouds. Fresh condensations of moisture seem to frequently appear, only to become dissipated in the warmer atmosphere, not many score of feet down the northern escarpment. I am informed that on some of the downs in West Sussex the highest parts are chosen now for pond-construction, as being more exposed to the south-west moisture-laden winds. Dew would not be deposited, of course, if the air were in rapid motion, but fog brought in from the sea would remain in spite of wind, provided the temperature were sufficiently low, the seemingly stationary fog being in reality continued condensation of moisture. If we consider mist as a possible source of our pond-water, then we can under­stand the use of trees overhanging a pond. This was the case with the ponds on Selborne down, referred to by Gilbert White. Clement Reid has noticed that when a sea-mist drifts in, there is a continuous drip from the smooth leaves of the overhanging tree. He also observes that thick sea-mists often cling to the top of the downs for several hours after sunrise. In the neighbourhood of Chancton­bury a good deal of clay is found in pockets in the chalk, and it has been suggested that the clay is discovered by the mists hanging thereover later in the day than on the chalk, and this may have led to the choice of certain sites for pond construction. The period of my stay on the downs in 1908 was, on the whole, remarkably free from fog. I have lived, however, many years near the downs, and have constantly rambled over them, and so can speak with a good deal of experience of them. I would add that, though in July, August, and September the downs were very fogless, morning after morning, as I looked out from the hill, the weald was shrouded in mist, with only here and there a higher eminence showing, the tops of trees or the steeples of churches. In a rain-gauge which was kept at Ditchling by Mr. Hope, gardener to Miss Tuppen, the fog was a measurable quantity when no rain had fallen. This fog was lowland fog and of quite a different nature to downland fog. It rose from the low-lying meadows and ditches, whereas the fogs of the downs are of sea origin and are wafted in from the sea. In 1902 and 1903 Dr. Marloth, of Cape Town, tested the amount of moisture deposited by the south-east winds in blowing over Table mountain, and compared the water found in an ordinary rain-gauge with that found in one which he sur­rounded with a bunch of short reeds. He gave as a result that from December 21, 1902, to February 15, 1903, that is, in fifty-six days, the gauge with the reeds had condensed a quantity of moisture equivalent to 79.84 inches of rain, and that quantity was recorded, although the last three times the gauge had overflowed. It is not too much to assume, that as the season of the south-east clouds extends over double that time, there would consequently be a condensation of moisture, exclusive of rain, of at least 150 inches during the dry season alone. This result was so remarkable that it appears to have been received with some amount of scepticism. Further experiments were therefore undertaken. It was found that at a site near Maclear's beacon (3500 feet) the ordinary rainfall for January, 1904, was 1.44 inch, but the gauge with reeds captured 48.42 inches of rain and other moisture. During the same month, at Woodhead reservoir (2496 feet) the ordinary gauge showed 1.83 inch, but that with reeds showed 13.73 inches. Objection had been taken to the use of a single gauge with reeds, in that reeds and bushes in nature would be screened by others standing in front of them. One gauge was therefore placed in the open, one in the midst of a thicket of bushes 5 feet high, and another in the centre of a field with reeds. There was found, as was to be expected, that there was actually a considerable screening effect, " but that the quantity which did reach the sheltered gauges during longer periods of south-east clouds was far in excess of the total of the rainfall for the summer months." I think, in view of this evidence, that vegetation, if overhanging a pond, will be beneficial to the pond. The fact remains, though, that some of the best of the downland ponds have no trees or bushes around them; in fact, it would be almost impossible to grow them in the exposed situations of the ponds. But, on the other hand, they all, or nearly all, have weed and grasses growing in them. The pond to which I have referred as One Tree pond has no weed in it, and it dries up regularly. There are two ponds between Keymer slipe and Ditchling beacon which I will refer to as No. 3 and No. 4 ponds. The two ponds are not more than half a mile apart, No. 3 being on the north and No. 4 on the south of the horse-track passing along near the brow of the downs. During the drought of last July there was a small shrinkage in the area of both ponds, but this was only noticeable by observing at different dates the clumps of reeds which here and there dotted the edge of the ponds, and also marked stones which I placed in certain positions. In wet weather there would be some drainage into No. 4 pond from the horse-track, and into No. 3 from a clump of gorse at slightly higher ground, but in a drought these would be negligible. There must have been something which kept these ponds, as well as that at Ditchling beacon, fairly filled, although No. 1 had dried up. In the cases of Nos. 3 and 4, I attribute this to (1) dew deposited on the vegetation growing out of the pond and running down the stalks into the water, and (2) to the depth of the water. It is noticeable that these and other ponds have high banks around, but the growth of common grass low down on the inner side of the bank shows that not for a very long time, perhaps never, has the pond been really full. There is a limit to the depth of a perennial downland pond, and probably about 4 feet is the greatest depth, although those that I have met with do not greatly exceed 3 feet. As regards the sufficiency of rainfall alone to fill the ponds, if we admit the fact, as White informs us, that these strange little ponds on the tops of the hills are full when those in the bottoms are dried up, that is, in times when there has been a dearth of rainfall, it must be evident that rain cannot be the sole means of the replenishment of the ponds. Most of the evidence goes to show that the ponds on the lower ground are the first to suffer in times of drought. This seems to show the necessity of something acting in addition to rain. The ponds on the South downs, which I have numbered as 1 and 3, also show this strikingly. No. 1 (One Tree pond), although 34 feet across (July 22), was very shallow, nowhere being more than a foot deep during the time that I watched it. In the drought, from the middle of July to the end of August, it dried up. Heated day after day by a hot sun, it parted but slowly at night with some of its heat, and the whole of the water was practically of one temperature. On July 24, the thermometer showed 67°•5 at 8.20 p.m., at 1 inch, 6 inches, and 9 inches, whilst that on the bank showed 58•5. On July 25, at 1.30 p.m., it showed 71° at 1 inch, 6 inches, and 9 inches, while the temperature on the bank was 67°. Evaporation of the pond's water rapidly proceeded, and on August 10 a few pools alone remained. On August 13 one pool remained, and the tracks of a traction engine on the bank showed that nature had received assistance in the drying-up process. No. 3 pond, on the other hand, was a fairly deep pond, about 3 feet deep in the centre. The drought of about four weeks certainly diminished the area of the pond to some extent, but not noticeably, and thermometrical readings showed differences of temperature at various depths. On July 26, at 6 p.m., it was 76° at 1 inch., 74° at 6 inches, 71° at 9 inches. At 8 p.m. the surface (1 inch) had gone down to 700.75, at 6 inches to 71°, while at 9 inches it remained stationary at 71°. The loss of surface temperature through the night would result in a great saving of loss by evaporation. Thus the shallow pond without weed dried up, and the deeper one with weed lost but little, and in the latter case it could not have been rain that maintained the pond, as the fall had been slight (0.004 on August 5), and both ponds had equally benefited by it. It is quite clear that something besides rain is required. This is to say, that during the period quoted the rainfall into the hollow was nearly 1 inch greater than on the down. When the rainfall on the down was 1/10 inch or over, that in the hollow exceeded it ; if less than 1/10 inch, then, as a rule, that in the hollow was less. 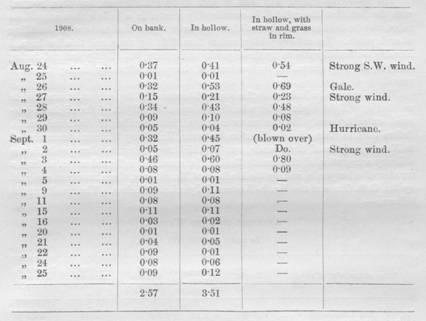 The third column shows the rain collected in a gauge in the hollow, in which some grasses and straws were arranged in a cluster in the collecting gauge. The hollow was of course empty, so that the top of the gauge may be regarded as being at the level of a pond a foot deep, the grasses representing weeds growing in such a pond. Thus it will be seen that during days of fairly heavy rainfall this third gauge collected more rain than in the case of either of the other two gauges. See particularly August 24, 26, and September 3. So far as these experiments go, it shows that more rain falls into a hollow than on the bank, and more falls into that part of a hollow where there are weeds and grasses than where there are none. From this it would seem to follow that where a pond is dependent on rain for its replenishment, the banks should be high, and grasses should be encouraged to grow in a pond, so long as their roots are not allowed to perforate the bottom. There is one fact that is sometimes not completely realized, and that is the large area for drainage which some ponds possess by reason of their broad margins. Three examples will suffice. No. 3 pond had a margin 28 feet across, although part of this was grass-covered. The pond was about 67 feet across. The pond area = 3333 square feet, and the area of the margin = 8197 square feet. No. 6 pond (High Park corner) had an uncovered margin 20 feet across, from the edge of the pond to the grass bank. The pond was 76 feet across. Thus the pond = 4120 square feet, and the margin = 5795 square feet. No. 9 pond (Waterhall) had a margin 15 feet across. The pond was 87 feet across. Thus the pond = 5380 square feet, and the margin = 4618 square feet. The gathering-ground will thus be seen to be considerable, and this, coupled with the fact that the rainfall is considerably greater in a hollow than around its ridge, may be held to show that rainfall may have a great deal to do with the filling of such ponds. Yet not everything, as has been held by some, and this has been, I consider, sufficiently shown by these ponds which have but slightly suffered during drought, although drawn on by hundreds of sheep day after day during the same period. The quantity of chlorine found in these is noticeable. In analyses of waters it is usual to regard the chlorine as derived from sodic chloride, although occasionally it may be present as a calcic salt. The specimen from No. 1 pond was obtained after the refilling of the pond, subsequent to the drying-up already referred to. In fact, the refilling may have been due to dew and mist, but certainly the greater part was rain. It contains the lowest proportion of chlorine of any in the series. It was situated about 5 miles from the sea. Sutton, in his Handbook of Volumetric Analysis,' states that unpolluted rain-water usually contains less than one part, but average town sewage about eleven parts. It is scarcely affected by filtration through soil. It is safe to say that there was no question of pollution by animal excreta, and the chlorine came in with the condensed vapour. The rain was brought in with south-west winds and gales, and probably washed down from the atmosphere into the pond a good deal of sea-salt, which had been blown inland. But it is likely also that the mists which blew in from the sea were condensed around finely divided salt nuclei, and this may to some extent have caused the presence of chlorine. Ponds which have been existing for a longer time would naturally, by process of evaporation, have a greater proportion of sodic chloride, and Nos. 5, 6, and 9, which have never been known to empty, bear this out. There is no evidence to show that dew will cause salt to be precipitated with it when the atmosphere contains a normal amount of the latter, although it has been stated that in the neighbourhood of salt-works dew is salt to the taste. I think that real dew, being drawn from a thin stratum of air resting on the soil, would scarcely be likely to contain an appreciable amount of salt, although if we extend the term " dew " to include condensation on the branches and twigs of tall trees, from which it may drip into a receptacle or pond beneath, such a form of condensation is as likely as rain to contain chloride of sodium. The word " dew " should, I think, be confined strictly to that deposited in the lowest stratum of the atmosphere. No. 7 pond is inserted in the table as a contrast to the others. It is situated at the side of a hill, and there was a good deal of drainage into it. On the face of it, it seems to be a very polluted pond. It was puddled with clay, which lies thickly on the sides of the hills overlooking Pyecombe. The amount of chlorine (12.15) is comparable with that contained in sewage, and probably the extreme hardness was due to the same cause as the excessive chlorine. The temporary hardness of Nos. 5, 6, and 9, CaCO3 for the most part, is no doubt due to the chalk puddling, although that of No. 6 is less than might have been expected. Nos. 10 and 11, bedded in flinty clay, although upon the chalk, show a remarkably small amount of temporary hardness. I am afraid these analyses do not lead us very far in the solution of the problem as to whether dew or mist have much to do with the filling of the ponds. But they certainly show that whether brought as rain, mist, or dew, the aqueous vapour comes from the sea. It may perhaps be of interest to state that I have made a small experimental pond on the Sussex downs, at Clayton, which I hope is now rapidly filling with the autumn dews and rains. It is too early yet to say what success may await its formation. One must wait for the hot days of another summer. Acting on the principle which has so far been generally accepted, that the pond and puddle must themselves be cooled in order to condense the vapour in the atmosphere, or at any rate to reduce evaporation, I proceeded to select the material which seemed, from numerous experiments, to be the most suitable, and yet was inexpensive. Pond-making is an expensive hobby, and if results are to be in any way of economic value to the farmer and grazier, we must not expect an outlay of a hundred pounds on a single pond, which is not to serve his purpose only, but that of at least two or three future generations on the same farm. Straw is fairly cheap, and would serve to some extent, but if puddled clay were laid down upon it, I fear the consequences would be that the straw would become in the first place moist, and therefore act as a good conductor of the heat of the earth to the water and puddle; and, secondly, the straw, by the crushing weight of the clay, would become so flattened out that much of its non-conducting qualities would become lost. Wood has been seen to be a good radiator, and it seemed to me that if wooden planks were made to form a slightly raised platform over the straw, excessive crushing would be prevented, and at the same time the wood would act as a buffer between the moist clay and the dry straw. Also, since wood acts as a good radiator and therefore a bad conductor, I essayed an experiment with what has come to be known as wood-wool, so that beneath the straw was thickly strewn a quantity of this non-conducting material. Thus we had from the bottom upwards, a chalk base, wood-wool, straw, wooden planks, and puddled clay. Next was placed a thin layer of powdered chalk, mixed with cement to prevent any untoward trampling through the clay whilst the pond was under construction, and, over this, powdered chalk was thickly strewn, in order to make a rough surface on which the dew would settle, and pending the coming of the rains. The layer of clay projected up the sides beyond the limit of the cement, and also beyond the subjacent straw. The whole was surrounded by a wire-netting fence. When, at some future time, the fence comes to be removed, the surface of the exposed clay layer and the powdered chalk will be worked by cattle into puddling. I have said that it is important that inexpensive materials be used, and I have endeavoured to suggest how this may be carried out. A pond of the usual pro­portions would, however, even with these economical materials, cost between £30 and £40 ; whilst if carried out as done in Wiltshire, with three layers, each of straw and puddle, and the digging out of the hollow in the first place, the expense would be about £100. So far as the name " dew-pond " is concerned, it seems to have not been in use before 1813. Gilbert White does not speak of dew-ponds as such. He was born in 1720, and the utility of making them on high ground seems to have been well known in his days. Walter Johnson, in his recently published Folk Memory,' speaks of a work by Christopher Packe, dated 1743, in which he describes a pond near Brabourne, in Kent, 100 feet above the spring below, which was never empty, even after a dry spring and summer. He thought that there was a "condensation of elevated vapours," and this went to feed the pond. He was no doubt correct. Johnson doubts if the present ponds antedate the period of the mediaeval sheep-masters, although he thinks there is a likelihood that dew-ponds of some kind were known in the Neolithic and Bronze Ages. Although undoubtedly true that in the Middle Ages the population came to settle in the lowlands as the woods and forests became cleared, we cannot fail to bear in mind that, long prior to such times, there was a population which utilized the hilltops, and bequeathed us the barrows and ancient encampments, and these must have had a water-supply. All efforts to suggest that the source of this was anything but dew-ponds have failed, by a process of the elimination of the unlikely. If it be admitted, as I think is now generally done, that the ancient camps were places of refuge in times of strife for men and cattle, a great quantity of water would be required, even though the period during which a camp was occupied was but a few days. Wells and springs may, after due consideration, be put out of court, and ponds remain the sole source of the water-supply. Puddling by cattle by accident, as suggested by Mr. F. J. Bennett, may have given the experience necessary for the making of a puddled pond, and experience would probably have shown that water remained longest where the chalk was covered with Tertiary or post-Tertiary clays. It is not improbable that some of the ponds are of Neolithic, or of even older age. Their age can, perhaps, be judged to some extent by their surroundings and position, but at best the evidence is but very scanty, and it is so easy to found so much theory upon so little fact. For the present I refrain from further theorizing. I can only add that there is much work yet to be done. So far as my conclusions have led me at present, a serviceable pond should be between 3 and 4 feet deep in the centre, with a further vertical rise of the same amount to the top of the surrounding bank. A few clumps of grasses, and reeds or rushes, should be encouraged to grow in the water. A gorse-bush or two should be planted on the south-western side, so that its drip shall be into the pond. The shelving bank should be chalk-puddled, or clay-puddled and smoothed down and rammed hard, or even cemented, to obtain such drainage as is possible. It should be near the head of one of the dry valleys coming from the south or south-west. Then, in the winter months, such a pond will be recruited by rain, snow, mist, and dew ; but in the summer and in times of drought the pond will be preserved from drying up by mist and dew. Grant that the word " dew " includes mist and fog, then in the summer, at any rate, some of the ponds will be entitled to be called " dew-ponds." On this account, therefore, I think the title by which they have come to be known might remain, without the various qualifications of the title which from time to time have been suggested. Dr. STRAHAN (before the paper): The first paper this afternoon is one by Mr. Martin, giving his observations on dew-ponds. I will at once ask him to give us an abstract of his paper. Dr. STRAHAN (after the paper): We are indebted to Mr. Martin for what I hope is only a preliminary report on this investigation on dew-ponds which he is carrying out. There remains, evidently, much to be done, and I hope that we may get an account of his future researches at some future period. Dr. MILL : The paper, I am glad to see, emphasizes the fact that dew has but little to do with the formation of dew-ponds or with the replenishment and main­tenance of them. I think, however, it would be a pity if that picturesque name should be allowed to vanish, as it really does not matter whether the name is strictly descriptive of the origin of the pond or not. The observations that have been made, and especially those interesting photographs showing the general breadth of the margin round the ponds, go a long way, in my mind, to prove that rain, using it in the technical sense, is the principal factor in filling and maintaining dew-ponds. One of the first difficulties raised by this statement is the fact that dew-ponds at a high altitude do not get dry in summer, while ordinary ponds at lower altitudes do. It occurs to me to ask whether ponds at a low altitude are made water-tight as carefully as dew-ponds are ? Are they not much more liable to leakage ? The statement was made in the paper that dew-ponds occur only on chalk soil. There are very similar ponds found on the summit of many other ridges in the neighbourhood of London ; along the ridges of Mill Hill and Totteridge there is a chain of ponds on the summit level which, I believe, never dry up, and they have certainly a very restricted drainage area to feed them, and must owe their replenishment to the same cause as the dew-ponds on the South Downs. 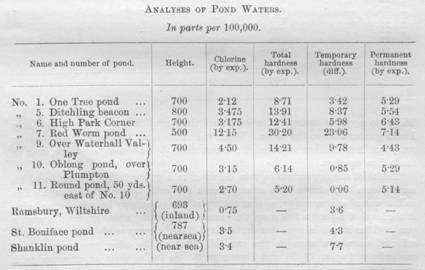 With regard to the question of the total amount of rainfall at different elevations, there is no doubt that the gauge in the centre of the newly excavated pond would collect more rain than a gauge on the raised rim of it, but it is not because more rain is falling on the centre of the pond than on the rim, but simply because of the eddies set up by the wind on the more exposed rain-gauge, preventing the rain from entering it. It is one of our greatest difficulties in getting measurements of the rainfall on mountains and high moorlands that the eddies set up by the wind carry away a great deal of the rain, and I now recommend that such gauges should be surrounded by a fence to break the force of the wind. I think that the statment made in the paper as to the rainfall on the downs being lower than that in the adjacent low-lying region of the weald is inaccurate. I have brought here a rainfall map of the south-east of England which I have prepared on the scale of 2 miles to an inch, and it shows that the rainfall in this district is closely related to the configuration of the ground; the highest rainfall occurring on the highest land, and the lowest rainfall on the lowest land. With regard to the relation of evaporation from a water-surface to rainfall, much information is published in British Rainfall annually. Observations are being made at thirteen stations in the British Islands. Some of these have been going on for many years, and it has always been found that the evaporation from an open water surface sufficiently large to have a temperature corresponding to that of a reservoir or pond is much less than the rainfall. In a position like the South Downs, the average rainfall will vary from 35 to 40 inches on the summit, and the evaporation there, on account of the wind sweeping over, may be as high as 20 inches, so I should expect that from 15 to 20 inches of water per annum would accumulate in au open straight-sided pond with no drainage area from surrounding land. It is an experiment I am anxious to try ; but it presents peculiar difficulties, and it has not yet been made in a satisfactory manner. That trees and shrubs condense or cause water to separate from fog and mist is, of course, well known, and this influence was worked out on Table Mountain by Dr. Marloth to show the influence of a bed of reeds in drawing water from the cloud-" tablecloth." One particular make of rain-gauge, the Fleming, was doomed fifty years ago on account of inaccuracy due to this action of a rod. It had a float with a rod attached to it, which rose as the rain-gauge filled, and as it rose it caught so much moisture that the records of these gauges were totally mis­leading. There is no doubt that a row of trees leaning over a pond, especially on a place like the South Downs, would pour a large quantity of water into the pond, drawn from the mists. It is very difficult to distinguish between rain, mist, and dew in some cases. Condensation of moisture from the atmosphere on the surface of water does sometimes occur in excess of the condensation that would take place in a rain-gauge, and the measurements of evaporation at Camden Square in the winter time show that there is occasionally a slight excess of condensation over evaporation on the average of one or more of the winter months every year. The amount is, however, very trifling. I think that the result of those observations has been important in showing that the exaggerated idea of the enormous power of dew to fill a pond when there is no rain has no physical basis. One would like to see them continued for several years, so as to eliminate what we must call "accidental" variations and find out the real underlying facts. I think the new dew-pond Mr. Martin is making promises well, and I look forward with interest to observations which, to a large extent, should solve the question of what happens on setting down an empty tank and leaving it for a year or two exposed to rainfall and evaporation—only it would be necessary to keep the sheep and also the birds away. We owe Mr. Martin our gratitude for undertaking so interesting and so troublesome an investigation. Mr. GEORGE HUBBARD, F.S.A. : As a visitor here I hope that I am not intruding in offering a few words on this subject, which is one that has occupied a good deal of my attention for some years past. I cannot say that I entirely agree with Mr. Martin's view on the subject, and more for the purpose of raising a discussion, I hope I may be allowed to single out those matters upon which I disagree. Mr. Martin says, " I am inclined to think that dew may be received by a pond on its surface, even while a pond has not yet fallen to the dew-point." I submit that this would be physically impossible, unless the surface of the water fell to a lower temperature than the air which lies above it. The chilling effect which is produced in the temperature of the water of a dew-pond is largely brought about by the incorporation of straw in its foundation. The straw is a good non-conductor of heat, and cuts off the transmission of heat from the earth to the pond. The water of the pond radiates heat into space during the night, and as the pond is thermally insulated from the earth, the tendency is for the water to reach a lower temperature than it would otherwise attain without a non-conductor of heat below it. I carried out an experiment where I employed mica instead of straw as a non-conductor of heat. I began by excavating the ground and covered the excavated surface with concrete ; the concrete was covered with pitch in order to stop moisture rising from below. On this pitch I laid down slabs of mica 24 inches square, and the whole was then covered by a layer of asphalte. During the night some hundreds of gallons of water would be deposited ; but as I had unfortunately made no provision for emptying the pond, I lost by evaporation during the day what I had gained during the night by condensation. According to a statement appearing in Symons' Meteorological Journal, which kindly criticized a lecture I gave in March on "Dew-ponds" at the Royal Society of Arts, it appears that the average rainfall on the tops of the South Downs is 35 to 40 inches during the year, whereas the annual evaporation is not more than 20 inches, and so from rain alone there should during the year be an accumulated depth of 15 to 20 inches. It is, however, in waterless lands where dew-ponds may be of great importance, and, since my brother, Dr. Hubbard, and I published our small book, entitled 'Neolithic Dew-ponds and Cattleways,' we have been interested to see that the Government have adopted the principle of obtaining a condensing surface at Gibraltar. A large portion of the rock has been covered with corrugated iron on a wood backing. The iron quickly radiates its heat, and the wood backing acts as a non-conductor. The consequence is that the warm moisture-laden winds coming off the sea are chilled by contact with the iron, and aqueous vapour is deposited on its surface, and now, if we are correctly informed, Gibraltar has for the first time a supply of pure water. In another locality, dew-ponds might be constructed with great advantage. Twelve miles away from Madeira lie the islands known as the Desertas ; they are desert islands, as their name implies, and here the rain is said never to fall. Madeira, of exactly the same geological formation, is one of the most fertile islands on the face of the waters, and the Desertas might be made as beautiful and as prosperous as Madeira if water could be procured. The night air is saturated with moisture, and the few fishermen who inhabit the islands obtain their water-supply by putting out fleeces at night and wringing the dew out of them in the morning. The conditions are all eminently favourable for the introduction of Dew-ponds in the Desertas ; but after the water has once been collected it should be used for the cultivation of trees. If once the trees are reared, then the natural rain will fall. In the Cordilleras clouds with rain falling from them may be seen hanging over the woods, while on the rest of the land the sun is shining. Mr. SIDNEY SKINNER : I should like to say how very interested I have been in Mr. Martin's paper. I forget how it was that my attention was first called to this subject, but I felt very sceptical about the possibilities of dew-ponds. There seems, however, to be a general concensus of opinion, whether right or wrong, that these dew-ponds do condense water by the method of dew-formation, and that point is worthy of examination. Another point on which information is required, is whether ponds in valleys are made with the great care with which ponds on high levels are made. I have just been spending a short time at Ventnor, and have been watching a pond on the top of St. Boniface down ; that pond has a very good puddled bottom. It is very nearly on the actual summit, 787 feet high. I marked the edge of the pond very carefully, and for two days we had a very considerable mist blowing over the pond, and I expected to find some more water in it. I was, however, astonished to find that during this time of mist the pond was getting emptier. Then we had a day on which some rain fell, and the water went up above the mark at once, and it confirmed me in the opinion, if I may take that single instance, that the chief amount of water must be due to rain entirely, and that such ponds are really very excellently made reservoirs for rain-water, and that the mist did not contribute very much. Mr. CARLE SALTER : There are a good many meteorological observations in existence which bear almost directly on this subject, and it seems to me that the chief problem is to ascertain bow far these observations may be trusted to indicate whether more water is precipitated in so-called dew-ponds than is precipitated on the land around. We know with considerable accuracy bow much rain falls, and we know approximately how much evaporation takes place from an exposed water surface, and it only remains to take some observations on how much water the sheep drink to enable us to calculate mathematically whether there is any un­accountable surplus of water in the ponds. It has not, it seems to me, been pointed out by anybody in the course of this discussion, that whilst the collecting area of these ponds is always somewhat larger than the actual water surface, the evaporating area is confined to the water surface, because the margin around the pond is nearly always very efficiently puddled, and although evaporation goes on freely from a chalk surface or from vegetation, I think the amount of evaporation from hardened clay puddle is almost nothing. Therefore, even if there were no more drainage area than the actual margin of the pond above the surface of the water, a comparatively small margin will double the collecting area, without in any way increasing the effective evaporating area. The result of that would be that, supposing the collecting area to be double the actual water surface, and the rainfall 35 inches, we get an equivalent of 70 inches of rainfall in the pond, whereas we can only allow about 20 inches for evaporation ; the difference is still greater than the mere difference between the depth of rainfall observed and evaporation observed. This seems to me to suggest that the increase due to rainfall is even greater than has been suggested. Dr. STRAHAN : Yon have already testified to your appreciation of Mr. Martin's work, and it only remains for me to ask him to reply to the various remarks that have been made on his paper. Mr. MARTIN: I am very much obliged to you for the kind way in which you have received my paper. I have to thank Dr. Mill for his remarks on the rainfall of the South Downs. With regard to his remark about retaining the poetical name of dew-pond, I agree with him ; I should be sorry to see the term go, and although the dew-ponds may turn out not to be "dew" ponds, I should be very glad to see the name still remain. With regard to the remarks about the amount of rainfall in the hollows, of course that is as pointed out by some of the critics ; one does not suppose that the rainfall is greater there, but merely that rain is drawn in by gusts and eddies of wind, and thus a hollow may collect more than would fall on the same area if level. Mr. Hubbard's remarks were interesting, and I wish he had been able to remain, because his remarks are not always, as it seems to me, sup­ported by evidence. He rather jumps at conclusions, I think, without having the necessary proofs. In regard to straw being put underneath the puddled bottom of a pond, this practice bears some resemblance to the practice in vogue in India for the production of ice. The point is, whether or no the straw can remain dry. If it does not remain dry, it is practically of no use. I have not come to any conclusion at present as to the utility of straw, but so far as I can see, I am almost inclined to think that the idea of putting straw underneath the puddle, in order to encourage condensation, has not very much foundation in fact. It is, perhaps, put there merely to keep the clay from cracking. I am very much obliged to Mr. Skinner for kindly undertaking the analyses shown in the paper, and for his remarks. I shall bear in mind what Mr. Salter says as to the evaporation being only from the pond surface, whereas the collecting area includes both pond-area and the area of the margin. I should very much welcome suggestions from any one on points in connection with the subject which might perhaps otherwise be overlooked.
" I much regret I cannot attend Mr. Martin's valuable and interesting paper on 'Dew-ponds,' especially as it is a very interesting subject, the elucidation of which may be of much service. A great deal of mystery surrounds these dew-ponds, and such investigations as Mr. Martin has undertaken should in a short time prove or disprove the question of the formation of dew-ponds. The proof of the general hypothesis on which they are formed might be of great service in finally settling the question of their origin and maintenance, and also point out in what way they could be usefully established, not only in many parts of our own country, where they would be of great service, but also in a number of places abroad. There seems little doubt but that a moisture-laden atmosphere is necessary for their formation, and following on this it is quite natural that those formed on hills will have more chance from the condensation of moisture owing to forcing of air up to the regions in which they are found, then those down in the valley.
" The expense of making such ponds is one necessarily to be taken into account, but the expense is not a great deal more than that entailed in making an ordinary pond, and there are many places where the establishment of such a pond would be of the greatest use to stock-feeders. "Mr. Martin has given us a most useful and suggestive paper, and I hope that this matter will be taken up practically with the idea of determining whether there are such things as real dew-ponds, and if so, how best they can be formed and utilized for the general benefit."